Our Partners and customers have consistently kept us on our toes to develop efficient ways of using Zoho Mail. In an effort to make the Zoho Mail experience even better for them, we have something exciting lined up in this update of Zoho Mail. Zoho Mail has now integrated with WHMCS, an online client management program that allows you to manage the sale and billing of software packages, as well as your client accounts. Once you configure the Zoho Mail module in WHMCS, your customers will be able to buy Zoho Mail services according to their preferences. All you have to do is install the Zoho Mail module for WHMCS from the WHMCS Marketplace, set up Zoho Mail as a product, and authenticate WHMCS to use Zoho Mail. You can configure the number of mailboxes that can be purchased, the plan, and the storage options that your clients can choose from. You can also manage your clients’ orders and easily verify your clients’ domains from within WHMCS. To learn more about using this integration, click here. WHM is another plugin that’s exclusive to Zoho Mail Partners. This plugin lets you configure a cPanel domain in Zoho Mail easily. Using WHM, you can add domains, verify your clients’ domains, and manage them all from one interface. Similar to the WHMCS configuration process, just install the Zoho Mail plugin for WHM from the cPanel Marketplace, complete the authorization process, and start adding your clients’ accounts. You can later verify the domains by using the verification code displayed in WHM, and use the clients’ Control Panel for further customization. For more information on the Zoho Mail plugin for WHM, click here. Please note that you should be a certified Zoho Mail Partner to use WHMCS and WHM plugins. If you are interested in partnering with Zoho Workplace, sign up using this form. To all of our Zoho Mail Partners out there, these much-waited for integrations are now yours to try. Please let us know your feedback in the comments. For many businesses, choosing the perfect email solution after buying your domain can be a nightmare. There are a multitude of technical specifications to consider, and the domain owner can often end up confused at the end of it all. If you own a domain with cPanel, this process has just become much easier. Zoho Mail has now been listed in the cPanel dashboard, making the sign up process for Zoho Mail significantly streamlined. The entire domain setup process—verifying the domain, configuring the MX Record, and adding users—can all be done from the cPanel interface. Once you sign in to your Zoho Mail account, you can customize it according to your preferences. 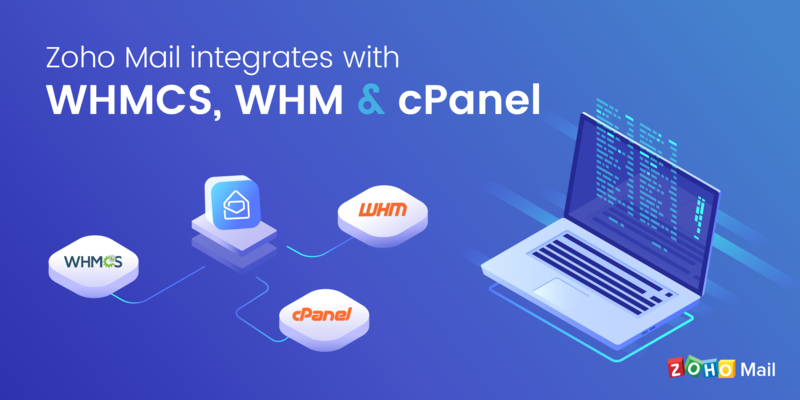 Since the cPanel plugin comes bundled with WHM plugin, it can be provided only by a WHM admin to their respective users. Click here to learn more about this plugin. Please give us your feedback! If there are more integrations that you’d like to see in Zoho Mail, drop your suggestions in the comments. Get the complete Zoho advantage: you can now use Zoho Mail along with the broad suite of products that Zoho offers by signing up for Zoho Workplace or Zoho One. I’m also a WHMCS user and this is an interesting proposition. 1. How is billing handled between partner and Zoho? 2. What is the pricing for partners? Additional question – is there any ability to bring existing Zoho accounts into WHMCS management? I set my customers up with Zoho mail as the default option and provide some limited support, but clients often feedback that they just want to pay for everything, including email, via my company. Umm, this is extremely good news! WHMCS user here. Am I right in thinking that we can actually now resell Zoho Email? And if so I presume we can set our own prices, and how does the billing to us from Zoho work? If this new features work like Zoho mail customer services its excellent. My account is blocked for 6 days and still blocked, very professional. Sorry for the inconvenience. Your account was blocked as we detected some suspicious login activity. It has now been unblocked, and you will be able to send and receive emails without any issue. Please write to us at support(at)zohomail(dot)com if you have any queries. Our support team will get in touch with you as soon as possible. The application will make use of the cPanel servers, but the account creation takes place in Zoho Mail. Hope this helps! If you have any further queries, please write to support(at)zohomail(dot)com. Please integrate zoho mail with blesta also. A lot of customers are looking forward to it. Thank you for your suggestion. We will check with our development team on the feasibility of this integration and add it to our roadmap. i can’t satisfied with zoho mail. i can’t received any mails in my zoho account. The mails sent only but can’t received. We request you to check if your MX Records are pointed to Zoho Mail. Please follow the instructions in this page for MX Record configuration. If the issue still persists, please write to us at support(at)zohomail(dot)com. i can’t received any email in my zoho account. Esto es muy bueno, muchas gracias! Great! Very good move. Congrats!! !